An employee under a contract of service who works less than 35 hours a week is considered as working part-time (PT). Overtime work is payable and the payment amount is pegged to the working hours of a full time (FT) employee of a similar role. *Annual leave cannot be encashed if the employee works at least 5 days a week and from 30 to 34 hours a week. A PT employee is entitled to the same benefits for Maternity, Paternity and Shared parental leave as a FT employee. Head to Profiles > Employee Listing > Employee Profile > Current Job Details > Rate of Pay. Select either Daily or Hourly from the drop-down list. 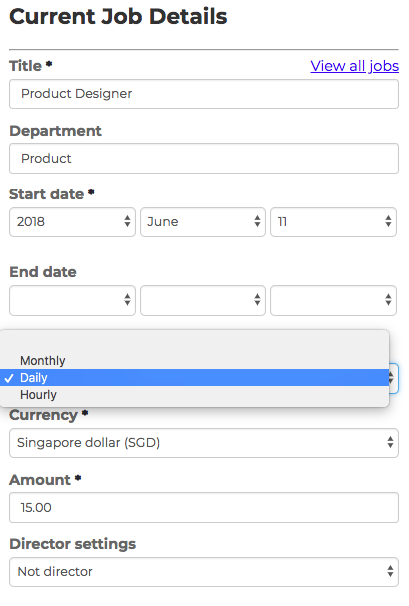 Indicate the part-time salary in the Amount field.